Recently, we had the opportunity to review some really fun products by Lego! The first was a really neat "Guardians of the Galaxy" set. The boys were REALLY excited about this, since they are in love with all things Marvel. I let Xander put the set together, since he is older, and its 196 pieces. As you can see, he is really happy with this new Lego set! Xander had absolutely no trouble putting this together. He said it was one of the simpler sets he has made, and I love that he can do it on his own. Accessories include boot thrusters and handcuffs; Also includes the invaluable orb! The minifigures are SO nice in this set. If you have a little (or big!) Lego fan in the house, you will know how important minis are. We really like that for the price of about $20 this came with not one, but THREE! Launch into battle against the Sakaaran's Necrocraft in the awesome Starblaster and help Star-Lord to escape with the orb! Place the Nova officer in the cockpit and launch into the sky. Fold back the wings for high-speed pursuit mode and then flip them up to activate arrest mode. Use the space blasters and boot thrusters of Star-Lord to outwit the enemy and protect the priceless orb! 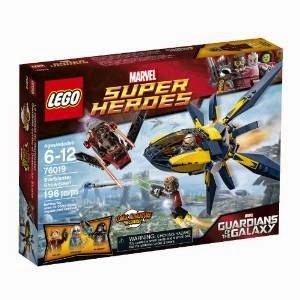 Includes 3 minifigures with assorted weapons and accessories: Star-Lord, the Sakaaran and a Nova officer. You can purchase this set on Amazon here for about $20.